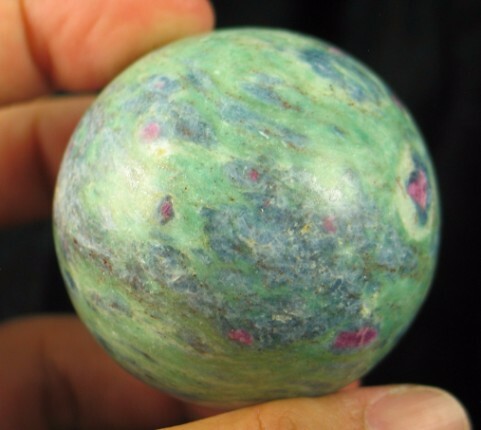 Bright ruby crystals are imbedded in a matrix of green fuchsite and ringed with blue kyanite creating a visually and energetically beautiful stone. 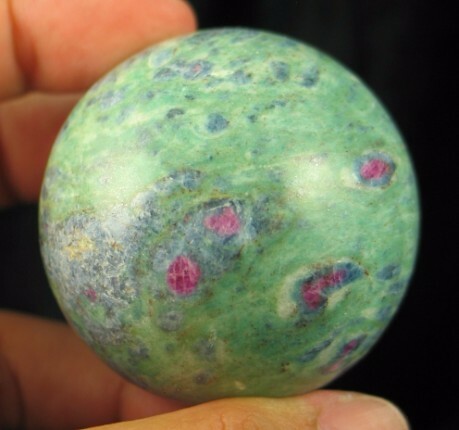 This is a wonderful mineral combination that is relatively new and rare. This combination concentrates its energies on our higher chakras, especially those of the heart, throat, and third eye. 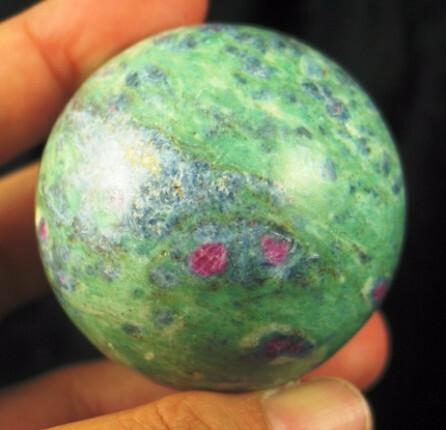 It provides grounding and protective energies to allow us the freedom of exploring new paths. This mineral combination is also protective. It will not accumulate negativity, and it will also assist to protect against negativity. It is a powerful tool for personal empowerment. It assists you to trust the images and information received by the third eye, and allowing us to act upon this knowledge with confidence. It allows us to voice what needs to be said, to have the courage to stand up to your beliefs and belief systems. It encourages you to be true to one’s self in all aspects of life. 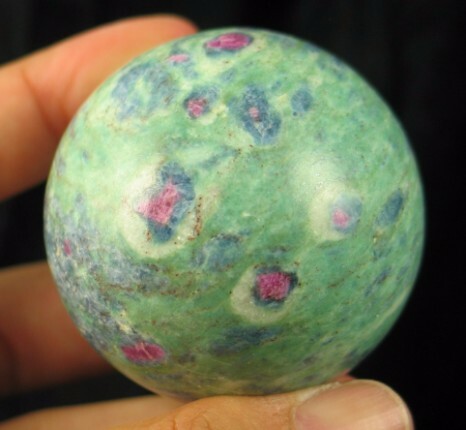 Carved mineral balls have been contoured in the spherical configuration, becoming the most unified of all sacred geometrical shapes. They radiate energy in all directions, making balls ideal for grid anchors, depending on purpose. Spheres facilitate smoother communication in group gatherings by rounding off rough edges. They are often used for scrying as "windows" to faraway places: future, past and present. They have been used in the activity of gazing, as if from afar, in order to assist one in the evaluation of a present situation or circumstance. 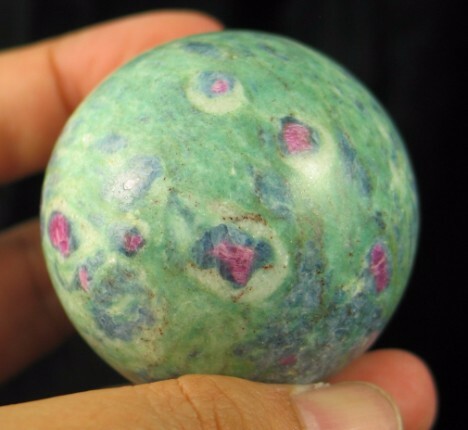 Crystal balls have been used to purify and to fill the gaps in the entire auric field when worn or held. 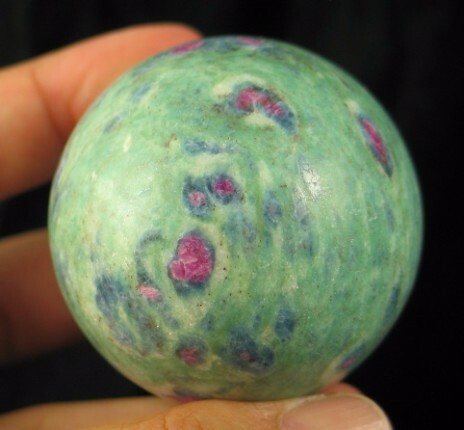 Small spheres are also used as charms and worn or carried to prevent and/or to ameliorate degenerative diseases. Ruby is known as a "stone of nobility, gathering and amplifying energy while promoting and stimulating mental concentration. It can improve ones success in controversies and disputes, encouraging gentleness and discouraging violence. 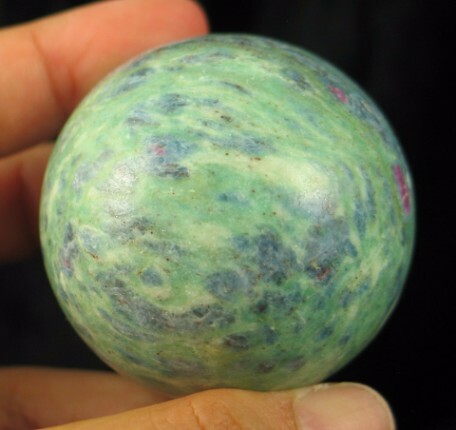 It is an excellent shielding stone, protecting on all levels and safeguarding ones consciousness from psychic attack. Ruby has been used to counter-balance stimulants such as nicotine and caffeine.